This year, the majority of the avant-garde programmes will be focused around the weekend of 1 & 2 November. 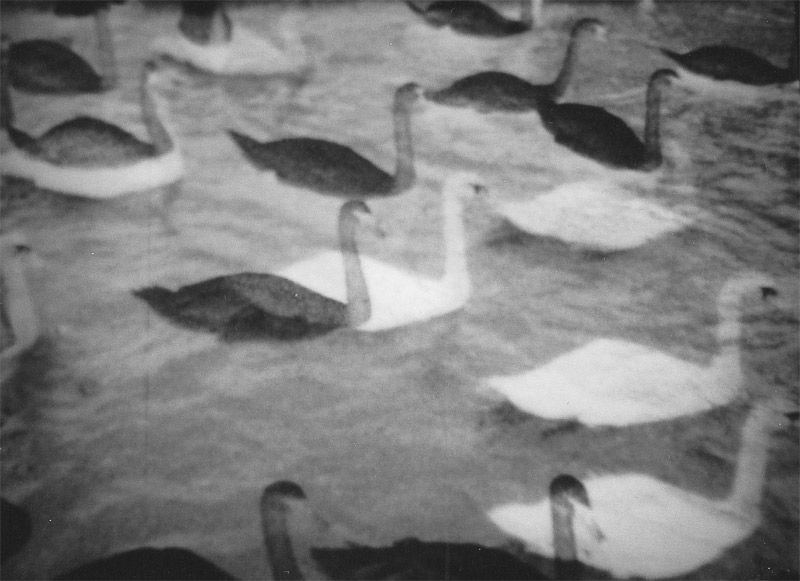 The Experimenta “Avant-Garde Weekend” is a unique opportunity to survey some of the most vital films and videos made around the world in recent years, and our only annual chance to do so on such a scale in England. All the mixed programmes plus selected features will be shown over the two-day period, and several of the filmmakers will be present to discuss their work. This concentrated period of screenings will hopefully encourage the film/video community to gather together. Three mixed programmes of new international short films feature works by Louise Bourque, Nathaniel Dorsky, Lewis Klahr, Guy Sherwin and Phil Solomon, “Video Visions” showcases recent tapes by artists including George Kuchar, Jeroen Offerman and Michaela Schwentner, and a new video by John Smith plays with two stunning collage works by Michele Smith (no relation), who is showing in the UK for the first time (as are many others). There are also documentaries on Jonas Mekas and Amos Vogel, two pioneering promoters of artists’ filmmaking. The weekend before that, on Sunday 26 October legendary New York filmmaker Ken Jacobs returns to the LFF with his recently completed 6-hour video “Star Spangled To Death”, which has been a work-in-progress since 1957. Distinguished Professor Jacobs will also present a lecture on “failure” the day after the screening. The Experimenta section of the festival also includes new feature length works by Mike Hoolboom, Guy Maddin, Pat O’Neill, Wang Bing and much more. The Spirit Not Of Life But Of Living (Jack Smith) floats and stumbles through the world, delighting in action for its own sake. Suffering (Jerry Sims) upsets the cosmic balance by finding happiness in the consolation of his dolls. To restore order, the dolls are seized by The Two Evils, only to be returned by Misplaced Charity, plunging screen and viewers into Limbo. The realisation of Star Spangled To Death as a 6-hour long video concludes a work begun by filmmaker Ken Jacobs almost a half century ago. 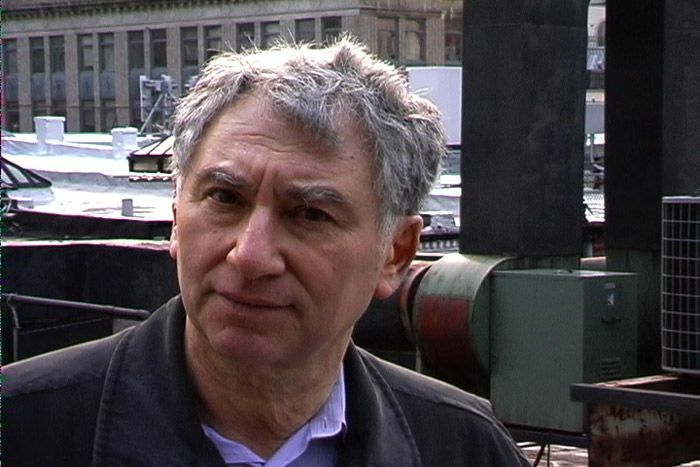 In this final version, which closely follows the original plans, long passages from public information films, cartoons, documentaries and musicals (often shown in their entirety) are interspersed by (and in tension with) Jacobs’ own footage, which was shot mostly in late-50s New York and testifies to the birth of a new cinema: liberated and spontaneous, absurd yet real, with zest and meaning. Those were different times and the participants then young and innocent (many have since died). But change a few names and faces, and the subject matter becomes remarkably Present. Touching upon politics, war, race, religion and science, it is not a curio or period piece, but an ongoing commentary on the country that made it possible. An indictment, or at the least a parable, of the USA in the modern world: a juggernaut careening to certain destruction. Star Spangled to Death will be shown in two parts with 60-minute intermission. Ken Jacobs has been one of the key figures of artist filmmaking of the past five decades. As a contemporary of Kenneth Anger, Stan Brakhage and Jonas Mekas, he was at the forefront of the New America Cinema movement that defined ‘avant-garde film’ in the 50s and 60s. Jacobs taught as Professor of Cinema at SUNY Binghampton for over 30 years, where his last course before retirement was on the subject of ‘Stupidity’. At the LFF in, 2000, he presented two sold out ‘Nervous System’ projection performances and this year he returns to London with his 6-hour video Star Spangled To Death. In this masterclass on ‘failure’ he will argue that in achieving socially set objectives, we rule out the possibility of unimaginable discoveries. Much of what passes for success can lead to predictability, conceit and the curse of celebrity, while there can be many triumphs as a result of ineptitude and confusion. Incredible things can happen by following the ‘wrong turn into adventure’. The illustrated talk will include screenings and references to the work of filmmakers including Erich von Stroheim, Charlie Chaplin and Oscar Micheaux. The Decay of Fiction is an intersection of fact and hallucination in an abandoned luxury hotel. The hotel is in Hollywood. The walls of the Ambassador are cracked and peeling, the lawns are brown, and mushrooms grow in the damp carpets of the Cocoanut Grove. The pool is empty, and the ballroom where Bobby Kennedy died is shuttered and locked. A tall, elegant blonde stands transparently on the terrace of her bungalow, smoking and watching the sunrise. Voices and tinkles waft across the lawn. A contingent of vaguely sinister men arrive and ask for Jack. Jack is expecting trouble, but not this kind of trouble. Louise, a guest, replays a nightmare in which she drowns Pauline so that she can marry Dean. The sun sets and rises again. Two detectives seem to turn up everywhere, searching for Communist literature and telling one another pointless stories of underworld intrigue. In the kitchens and behind the scenes the daily routine continues, individuality melts, and workers fuse with their jobs. Winter passes, and then another summer, and finally it is Halloween, and there is a costume ball which claims the life of Rhonda the evasive soprano. And then the building comes down in a clatter of Spanish tiles and concrete, and fact has finally become fiction, once again. I scribbled the words “The Decay of Fiction” on the back of a notebook almost forty years ago, tore it off and framed it fifteen years later, and have wanted ever since to make a film to fit its ready-made description. To me it refers to the common condition of stories partly remembered, films partly seen, texts at the margins of memory, disappearing like a book left outside on the ground to decompose back into the earth. The film takes place in a building about to be destroyed, whose walls contain (by dint of association) a huge burden of memory: cultural and personal, conscious and unconscious. To make the film was to trap a few of its characters and some of their dialog, casting them together within the confines of the site. The structure and its stories are decaying together, and each seems to be a metaphor for the other. I am interested in exploring the boundaries of believability. The narrative tradition insists that, no matter how fantastic the story, its surface must be seamless. By contrast, I call attention to the artifice, all the staged aspects, and allow the well-worn stories to slip over and through one another. The film’s intention could be described as wanting to take stories off the screen and into the imagination. I like to work within the gaps between reality and story, to look at what is going on around the story, its context, and to make that a part of my conversation with the audience. An apparently mundane view of a pedestrian area … what is happening? Image seamlessly sticks and cuts, sound drifts from super-realism to atmospheric score. Time suspends as the sense of alienation and displacement distends. The centre of the city is a lonely place. A horizontal arrangement of bands of light slowly gives way to emerging human forms, seen from above, passing through the frame. Though digital manipulation, a situation is suggested, but never seen. Sound is a sonic crackle and pulse. Dynamic recycling of treated and degraded video, structured to a track by electronic sound artists Radian. Footage of a boxing match is reduced to printed still images and its constituent dots are enlarged and contrasted into an optical moiré. Assault not insult. A blitz of sound and image by Japanese animator, graphic designer Tanaami, based on his 1975 film Why. Reinke protests the ubiquity of theory and conjecture, while proposing a new art school where nothing is produced except discourse. To protect the students from undue influence, the pages of the library books must be glued together. George’s video diaries continue, slipping between reverie and reality, with a visit to the SF Art Institute, dinner in Chinatown and a lush daydream of sprouting seduction. Sap rises and spring swings when a tour of a friend’s garden detours into flights of floral fantasy. Travelling shots from a cross-country road trip are tiled and matted to propose impossible vistas. Geiger seeks an equivalent, format-specific editing style for digital video, to those techniques he has used for concentrated 16mm filmmaking. Gaudily lit waxworks of Hollywood icons and the animals of a diorama, rapidly intercut with their subjects’ natural environments – classic movies and the zoo. Inspired by rumours of satanic messages hidden in rock records, Offerman memorised and performed the vocal track of Led Zeppelin’s ‘Stairway to Heaven’ in its entirety, backwards. A continuous shot taped outside St. Paul’s Cathedral and then reversed to present the classic song in a skewed, but legitimate, new way. Sincere, admirable, and very, very funny. Critical commentary on the business practices of the music industry, ripping apart the illusory promises made to the consumer. A music video for a group of cloned pop stars. Nemerofsky Ramsay splits his own personality to create the perfect boy band of four distinct and desirable youngsters. All the ingredients are there; and it makes so much sense on a commercial level. Their song of heartbreak is an Elizabethan madrigal, ‘Come Again, Sweet Love’ by composer John Dowland (1563-1626). A night-time memorial to the World Trade Centre site and its ‘towers of light’. A series of meditations on nature and the animal kingdom, comprising both physical and metaphysical reflection. Each has the subtle, granular pulsing that makes it seem as though these could be the first rolls of film ever wrenched through a camera. A portrait of New York’s Bowery and its time-warn occupants. Though no longer solely a refuge for alcoholics and the lost, some of those characters remain, and their world is revered by Kels’ camera, displaying humour and a deep sense of camaraderie. Using the modest Super-8 gauge to film his immediate personal surroundings, Jimmy Robert has developed a profound personal style. Fleeting moments are combined in editing, evoking moods through the juxtaposition of images. A somnambulant chronicle of night-time luminosity, and the sounds that keep us awake in the lonely twilight. Tactile, imageless film created using clear film and black pigment, which has been manually rubbed into a layer of transparent silicone. In projection, it becomes a rapid and infinitely complex hypnagogic vision. Points of light burst through the darkness in a surge of abstract motion. Luminous stimulation for the subconscious. Science, the space race and more earthy pursuits: formal and narrative strategies applied to found footage to create a supernatural adventure. Direct cinema barrage of light and colour, in cinemascopic glory. A symphony of nature told in a shower of golden colours that reveal a microcosm of cellular structures. Film emulsion transfigured by incubation in menstrual blood. The emergence of consciousness as beatific reawakening. A whiff of the ‘The Passion of Carl Th. Dreyer’ somehow embodied within a hand processed, scratched, painted and bleached Super-8 blow-up. Music by cyclic Icelandic wonderkind Eyvind Kang. Using collage animation, Klahr conjures up an evocative, hermetic world. The sense of quiet melancholy suggests a loss of innocence, both personal and collective, which is pictorially represented by the 1950s consumer boom. A series of topical news headlines sound like it might as well be the end of the world, but this is 1993, the year the filmmakers’ nephew was born. It’s an event that leads him to contemplate the ceaseless urge to photograph and be photographed. For Hoolboom, this compulsion indicates our discontentment with the world, which is compensated by reproducing it as ‘experience in a crisis-proof form’. Imitations of Life is a 10-part suite of dreams and memories that integrates original footage with instantly recognisable images from commercials, cinema classics and recent blockbusters. In Jack’s early years, the filmmaker sees (and shows us) the world through a child’s eyes. Later, this sense of open wonder is retained, though tempered in the knowledge that modern life doesn’t permit us such indulgence. We are ‘the children of Fritz Lang and Microsoft’, striving to give our lives shape and meaning through photographs, tv and movies. Through a vast wealth of adopted images, this video questions the values of lives lived through the lens. If movies carry our collective baggage and teach us about the world around us, do they hold us back from inventing the future? Expanding on the structure of Panic Bodies, with its discrete but interconnected shorts, the latest found-footage feature from Mike Hoolboom is a ten-part meditation on childhood, visual representation and the future in a world of pictures. Breathtaking in its encyclopaedic recycling and appropriation, the film moves beyond scratch video, assemblage and recontextualisation; in Hoolboom’s words it “strains childhood through a history of reproduction, culling pictures from the Lumières to the present day in order to find the future in the past.” Much more than just a poetic essay on mediation and simulation at the end of history, the film situates the ethical challenges of the future within the context of picture making, pointing to our current crisis as one of (a failure of) imagination, representation and technology. 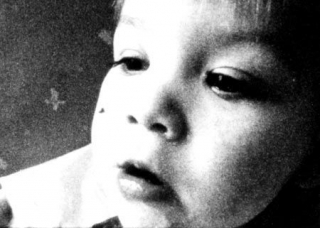 Already acclaimed as a short in its own right, Jack works as the heart of the film, with Hoolboom’s familiar, wryly wise voice-over recounting visits with his nephew as we witness Jack growing up in processed Bolex images. Here we see possibility, for Jack makes happiness his profession and ponders if politics could ever be an expression of love. 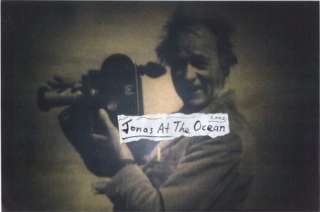 ‘Jonas Mekas and his friends of free film, art and music. Together with his brother Adolphas, Jonas Mekas left Lithuania during World War II and eventually travelled to America as a ‘displaced person’. After settling in New York, he soon purchased a movie camera and began documenting the lives of Lithuanian immigrants. Within a few years, he was to become a central figure in the movement toward the recognition of film as art. The brothers’ arrival in New York (1949) is the film’s point of departure, and readings from ‘I Had Nowhere to Go’, Jonas’ autobiography of the period, appear throughout. Sempel loosely traces Mekas’ post-war life, as told through his interactions with other members of the arts community. There are visits with Robert Frank, Merce Cunningham and Nam June Paik, and with La Monte Young and Marian Zazeela in their ‘Dream House’. Allen Ginsberg tells the story of Pull My Daisy and the birth of beat cinema, while Phillip Glass speaks of Jonas’ independent sprit and the beginnings of the downtown arts scene in the 60s. Sempel borrows liberally from Mekas’ own films, while offering us glimpses of a life which we are more often used to seeing from his own point of view looking out. This new work by John Smith looks down onto a busy Viennese intersection and a corner bakery. Constructed from hundreds of still images, it presents situations in a stilted motion, often with sinister undertones. Through this technique we’re made aware of our intrinsic capacity for creating continuity, and fragments of narrative, from potentially (no doubt actually) unconnected events. Michele Smith creates intense, hand-made collage films from a diverse assortment of film materials, mixing formats and contents with spontaneous regularity. Using a heavily re-edited 16 or 35mm film as a base, she manually weaves in other film footage, plastic shopping bags, translucent products, slides and other materials to create a master reel that is impossible to duplicate. Being too unwieldy to pass through a laboratory printer, the work must ultimately be shown on video, with the transfer done intuitively by hand, shooting frame-by-frame with a digital camera. Unlike, 2002’s Regarding Penelope’s Wake, these two new interchangeable pieces also contain digitally interwoven found video footage. They are truly amorphous time-based sculptures whose barrage of visual stimulus leave themselves wide open to personal interpretation. This is original and challenging work, demanding of its audience, and rewarding in its illumination. 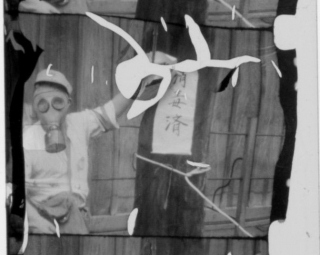 This new work consists of one film split into two parts. Two parts which can be seen in either order, or separately if one so chooses. In Like All Bad Men He Looks Attractive the mixed mediums are woven together on Mini DV. The materials are one reel of 35mm film and two reels of 16mm film. Inset into the 35mm film are plastic shopping bags, translucent plastic folders and plates, Mylar drafts used as blueprints for bridge construction, Viewmaster slides, paparazzi slides found at a tourist memorabilia shop on Hollywood Boulevard (including Zsa Zsa Gabor, Charlton Heston and George Peppard with a big white rabbit), slides purchased in the gift shops at the Getty Museum and at Hearst Castle, “sign here” tabs from my accountant, the wings of a dying butterfly that I tried to rescue from the hot pavement of a grocery store parking lot, Hollywood movie trailers, 8mm home movies and stag films, 16mm footage (including an episode of Green Acres), Viewmaster stills from 1970s TV shows, etc. Some things were not inset into the reel but recorded in the same manner and later cut in digitally. Panels, or film ‘carpets’: large mats made of 16mm film. Old magic lantern slides. The base film the elements are physically cut into is a workprint of raw footage of an unknown actor with a bandaged finger standing in front of the camera. He occasionally raises an envelope and reacts to a clapboard. I received this reel of film from a friend who’s a bit of a packrat (like myself). Before I met him, his house had burned down and this reel was one of the few items which survived. The decayed parts are where the emulsion melted from the heat. 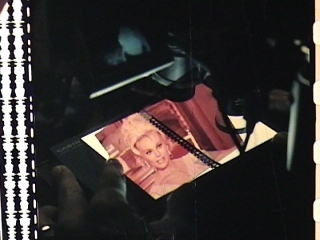 The digital transfer was hand shot frame by frame against a crafter’s lightboard with a 25 watt candelabra bulb because the plastic folders and other elements inset into the 35mm would not go through the telecine transfer machine. I decided not to set an exact frameline and moved the filmstrip casually past the camera. This process added a feeling of the material celluloid form bending and moving as fast stills in time, with light reflecting through and glaring against it. I shot each frame as a still – which then had to be loaded into the Mac and sped up. It’s approximately equal to 10 frames per second, film speed. I alter this rhythm at different points in the film. There is also a cheesy faux-shutter effect for the still shots which was built into the camera I used – it becomes a chaotic and erratic half-flicker when sped up. Intercut into this are found VHS tapes I bought with my grandmother at the local Greek deli and produce shop. They were getting rid of their rental videos and for some reason I must have looked like someone who would buy the entire shopping cart full because the shopkeeper made a deal and offered all of them to me. I used footage from four of these films in sections during both films. While watching these tapes I decided this material would be an interesting element to add to my film. Much of it is cut at an interval of three digital frames (which is about 30 frames per second) after every 12 frames of transferred film. A friend did this while I sat by and watched and told him where to split the images because I was at that point not too keen on editing digitally and did not know how it would turn out. Regarding Penelope’s Wake was pure in its filmic structure. The only digital editing done to that film was to clean up between reel changes and breaks in the film during transfer. By the end of the digital interweaving edits in the new films, I jumped in and did it myself and reworked some rhythm structures. As the work progressed, I became quite pleased with the possibilities and interactions of this new set of elements, and with the subtle contrasts and interactions of different mediums, times, and textures. They Say consists of two reels of heavily edited (frame by frame) and overlaid 16mm film. It was then intercut with the grainy and scratchy melodrama rental tapes. I used a few 16mm found footage source reels as the main focus to play with narrative structure in a way related to but different than in my first work. I used a lot of footage from one narrative short film about a boy and a wild horse. When nearing the end I tired of editing it and decided to put it out into my garden and then dumped a few litter boxes on top. Contents: wood pellets and bunny poop. I forgot how long I left it outside … it rained a few times. Perhaps a week. It was later washed with laundry detergent and hot water.